The Sensex on Tuesday closed at a new lifetime high, surpassing its previous one after a tumultuous seven months. The 30-share blue chip index ended at 39,057, up 185 points or 0.5 per cent. On Monday, the index had surpassed its previous high on an intra-day basis but had failed to close above its all-time closing high of 38,897 touched on August 28, 2018. The Nifty rose 44 points or 0.4 per cent to end at 11,713. The index is just 26 points shy of a fresh record high. India became the first major global market to scale a new peak in 2019. While Brazil and New Zealand have touched new record highs this year, their size is much smaller as compared to India. 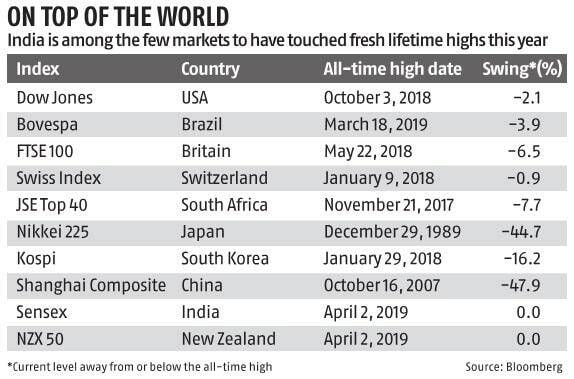 The US and Switzerland are the only markets in the top 10 that are very close to their lifetime highs. Both had touched new highs last year. The US Federal Reserve’s decision to put the interest rate hike on hold has given an impetus to most global equities since February. 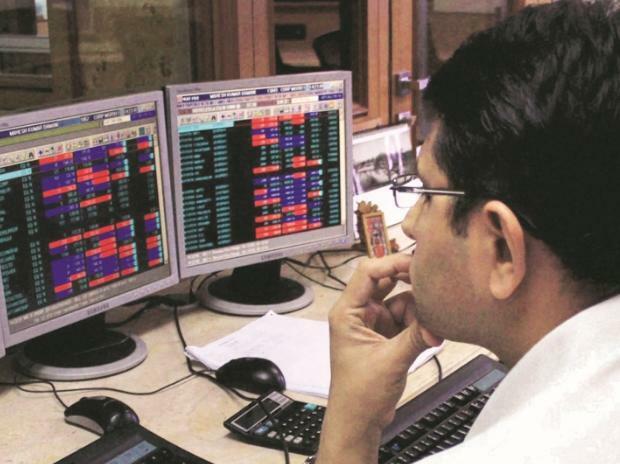 Besides positive global sentiment, hopes of a rate cut by the Reserve Bank of India (RBI) at its April 4 policy announcement, earnings optimism, and bets on Prime Minister Narendra Modi being re-elected, have fired up the bulls. Till mid-February, India was among the worst-performing markets due to worries over rising oil prices, uncertainty over election results, rising tensions in Kashmir, and fears of default by large corporates. Investors have put all these worries behind, helping Indian markets post the world’s biggest rally in March, with the Sensex gaining nearly 8 per cent. The icing on the cake was bullish views from strategists at foreign research firms. Last week, BNP Paribas analyst Manishi Raychaudhuri upgraded Indian stocks to overweight, citing stability in corporate profit growth and indicating that banks’ asset quality problems were now being seen as “a thing of the past”. Earlier, the Goldman Sachs group had said that Indian markets would rally in the run-up to the election, and raised equities to the equivalent of a buy rating. Foreign inflows have seen a resurgence, given global funds purchased a net $7 billion of Indian shares in the first three months of 2019. This puts the country on track for the biggest annual flood of overseas capital since 2017, when the Sensex hit new record highs on 38 occasions. Last month, foreign institutional investors (FIIs) pumped in over Rs 31,000 crore ($4.7 billion) into domestic equities. Their buying has continued in April, with FIIs buying shares worth Rs 544 crore on Tuesday, and Rs 900 crore a day earlier. Experts, however, said that the pace of foreign flows seen last month was unsustainable. Neelkanth Mishra, India equities strategist at Credit Suisse, said foreign inflows into domestic stocks may not be sustainable even if the global economic momentum turns positive on account of China’s stability and status quo by central banks. “We believe this pace of inflows will moderate,” said Sampath Reddy, chief investment officer at Bajaj Allianz Life Insurance. Technical analysts believe the markets might be range-bound in the near term. “We expect the Nifty 50 to be in the range of 11,200-12,500 over the next 3-6 months, with intermittent sessions of volatility in the run-up to the elections,” said Jay Thakkar, head of technical research at Anand Rathi.